I can't say enough thank you to your team. You did a fantastic job and you are very professional. I would definitely recommend your team to anyone who would like to have makeup for their wedding in phuket.
" Thank you Wow make up for doing such an amazing job of our hair and make up at my wedding in Krabi. You did an amazing job! " " Fantastic!!! Love the pictures & it was a great day! Pum did an absolutely beautiful job! Will be in touch soon. " Kathryn wrote: " Thank you again to the team at wow!! I absolutely LOVED my hair and makeup along with the bridal parties! Highly recommend your services of the team,very friendly, talented and approachable!! Xxxxx "
" Geoff wanted to thank you. Your email responses were very prompt and Lindsay is a sweet and professional makeup artist. " " We had a fabulous time and the makeup and hair was just fantastic. A very big thank you to Oh and Pum for their efforts. It was great day getting ready and we were all so pleased with our hair and makeup. " " Please tell your wife I said thankyou! She is the sweetest and she was so nice. I loved my makeup too. " I was so happy! My friend looked absolutely stunning too. " " I just want to say thank you so much for doing such a fantastic job for my wedding. The ladies were extremely polite and professional and they both did a phenomenal job. I will highly recommend them!! " Andrea wrote: " Loved your work, ladies! And I love your hair Oh :) "
I just wanted to get in touch and say a massive thank you for the amazing hair and make up that you did for my wedding in March. You and your team did such an amazing job, myself and all the girls felt like princesses on the day so thank you for that. I have attached some pictures from the day in case you wanted to use them for your website. "Oh and the girls were fantastic to work with. They were both professional and friendly"
"Thank you all so much for your wonderful hair and makeup services on our special day. The barefoot sandals were amazing, thanks Oh you're so clever! and after seeing our photos many of my friends are extremely keen for the amazing experience!" "Thanks to the three girls and yourself for providing a great service and stress free day"
"Oh was Wonderful.So sweet & professional.I was very happy with my hair and makeup." myself and my mum were super happy with our hair and make up. Thank you to for coordinating everything"
You guys did an amazing job!!! When we walked in, everyone already there and they all stopped for a few seconds, amazed with my hair and make-up. Well done, I love it so much." "Thank you so much girls for the amazing hair and make up for my wedding"
"Just a quick note to say thanks and to let you know how happy we were with our makeup and hair yesterday. nothing was too much trouble and they took such care to make sure we were happy with everything. Oh is a real professional and this is obvious from the way she approaches her work. We could not have chosen better." "We could not praise the ladies enough for all they did for us on the day. I know Chantelle was extremely happy and she couldn't have wished for anything more on her wedding day. the wedding day wouldn't have been the same without all three ladies. They provided services beyond what was required and for that we are extremely great full. The photos look amazing and from the bottom of our heart we thank you all again. We will definitely recommend you to any future friends/family heading to Thailand. " "Thank you so much for yesterday.Oh did a fantastic job. " "I wanted to sincerely thank you and the team for absolutely beautiful hair and makeup. I was so happy with everything, the ladies were lovely and very professional. More importantly all the other ladies were extremely happy with their hair and makeup also. when we receive the video Ill send you the link also. 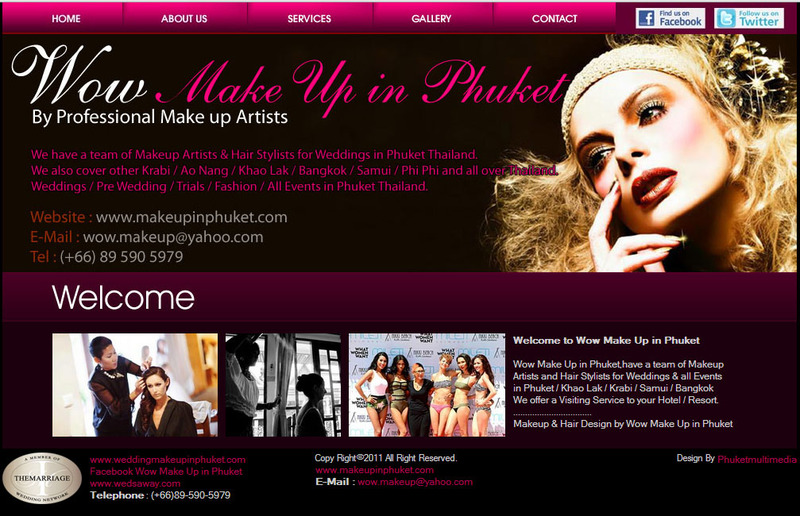 I would absolutely recommend WOW makeup to anyone in Phuket." "Amazing day,Oh has a bag of magic"
"Gorgeous work as always xoxoxox"
"Most amazing hair and makeup artists yesterday! Thank you Wow Make Up in Phuket !!! Your work is fantastic"
you are so organised and professional and I will recommend Wow Make Up in Phuket to absolutely everyone!!! Your work is amazing and nothing was too much trouble, I never imaged I could look so beautiful for our wedding day!!!! Even organising everything from Australia before we left for Phuket was so easy and efficient!!! I can't believe how lucky I was to have you do our hair and makeup for our special day! THANK YOU!!!!!" I forget know that we were more than delighted with their very professional and international work. "Thanks so much for making my day so special. your all did such a fantastic job!" "Thanks for being a part of our special day. I wish we could relive the moment again." "Here comes the bride. Thanks for all your hard work Oh and Bee! Oh and Bee were great! Everyone was really impressed and really pleased with how they looked with their hair and makeup! Thanks once again for all your help!" "I just wanted to email to tell you how much of an amazing job the girls did with our hair and makeup on March 18th at the Phulay Bay. All of your ladies were very professional and listened to exactly what each of us wanted but also added their own suggestions. Each of my bridesmaids and my mum looked absolutely stunning and I can not thank you and the ladies enough! I loved my hair and makeup and felt so amazing all thanks to your ladies!" "Thanks to the amazing Oh who did our hair and makeup for the day Wow Make Up in Phuket"
"The wedding was beyond my expectation. Thanks to you, everyone loved my look. And it lasted very long. Without any doubt, I will recommend you to my family and friends." "Thank you sooooo much ka, P'Oh for saving my life and my bride. Your generosity has been more than wonderful. My bride got so lucky to have you fixing her hair. Thank you thank you and thank you million times." "Thank you to everyone who helped us celebrate our wedding. We had the best time. Also a big thank you to Make Up Artist Phuket. You girls are just amazing also Petchari Pootapetch thank you for making our day stress free." "Thank you for you making up me 2 weeks ago in Anantara Phuket. we can spend so happy time for our wedding ceremony." "Just wanted to drop a note to say thank you to you, Oh and her assistant for the hair and make up on 17th April. Everything turned out exactly as we had hoped, everyone looked beautiful and we were all really happy with the results! We will definitely recommend you guys to anyone looking for hair and make up in Phuket. If we can help to provide any feedback for your website do just let me know."